Bolivia's first communications satellite, named for an indigenous fighter who opposed Spanish colonial rule, launched Friday on a Long March rocket from China. Weighing 5.2 metric tons, the Tupac Katari satellite launched at 1642 GMT (11:42 a.m. EST) on a Long March 3B rocket from the Xichang space center in southern China's Sichuan province, according to China's state-run Xinhua news agency. Boosted by four liquid-fueled strap-on boosters, the 185-foot-tall rocket flashed to life at 12:42 a.m. Beijing time Saturday, flying east from the mountainous launch base and delivering the telecommunications payload to orbit about a half-hour later. "Never again will we be incommunicado, as before when we were ... in the dark," said Bolivian President Evo Morales, who witnessed the launch at Xichang. According to Xinhua, Morales was the first foreign head of state to view a satellite launch from China. The Tupac Katari satellite is based on the DFH-4 spacecraft bus developed by China Aerospace Science and Technology Corp. It is designed for a 15-year service life. The Long March 3B rocket deployed the spacecraft, also called TKSAT 1, in an orbit reaching more than 25,000 miles above Earth with an inclination of 24.8 degrees, according to U.S. tracking data. Over the next few weeks, the satellite will circularize its orbit at an altitude of 22,300 miles over the equator at an operational position at 87.2 degrees west longitude, according to the Bolivian government. Officials said the Tupac Katari satellite will be operational in March. China and Bolivia signed an agreement for the construction and launch of Tupac Katari in December 2010. According to a press release issued by the office of President Morales, the project cost $302 million and was jointly financed by the Bolivian government and the China Development Bank. In a speech after the launch of Tupac Katari, Morales said Bolivia was interested in launching an Earth observation satellite in 2017. He said the Bolivian Space Agency would develop a framework for the remote sensing project next year, adding the satellite would survey natural resources from orbit. Friday's successful Long March 3B mission was China's first satellite launch since a Long March 4B rocket failed in a Dec. 9 flight to put the CBERS 3 Earth observation spacecraft into orbit. 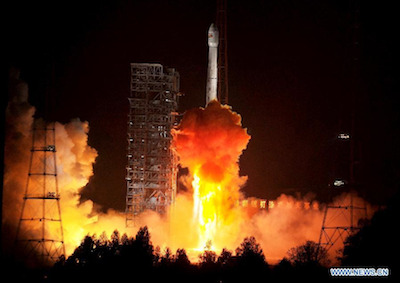 The CBERS 3 satellite, jointly developed by China and Brazil, fell back to Earth after the fuel flow to the Long March 4B rocket's third stage was interrupted, according to a statement issued by China Great Wall Industry Corp., China's commercial launch services provider. The Long March 3B rocket launched Friday uses different third stage engines than the smaller Long March 4B.